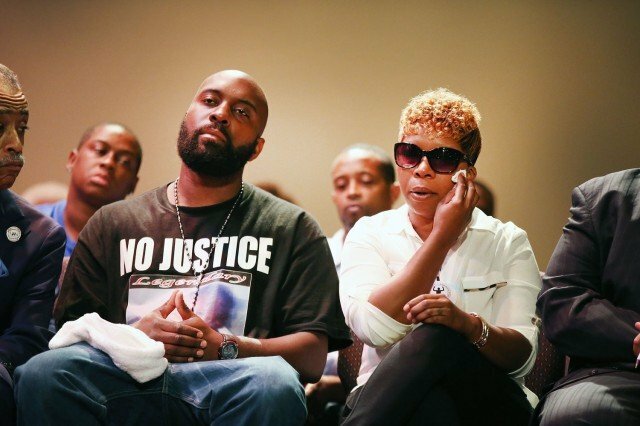 Michael Brown’s father has appealed for calm ahead of a grand jury decision against Officer Darren Wilson. Michael Brown, a black teenager, was shot dead by police in Ferguson, Missouri, on August 9. His father said “hurting others or destroying property it not the answer” in a video posted online. Michael Brown, 18, was killed by white Officer Darren Wilson following an altercation. There were more protests overnight and two people arrested as demonstrators gathered outside the police station. President Barack Obama has joined the calls for calm. He told ABC News: “This is a country that allows everybody to express their views. Allows them to peacefully assemble, to protest actions that they think are unjust. Late on Friday, the FBI arrested two men suspected of purchasing explosives for use in protests, CBS News reported. US Attorney General Eric Holder earlier urged police in the area to show restraint, providing new guidance on how to maintain public safety while protecting free speech rights. A St Louis County grand jury is currently weighing criminal charges against the officer involved in the shooting. No word has yet been given on when a decision will be announced. Missouri Governor Jay Nixon has declared a state of emergency in the area and called in 400 National Guard troops in anticipation of protests should charges not be filed in the case. Darren Wilson, meanwhile, has maintained he acted in self-defense. Initial protests in August turned violent as demonstrators clashed with local police using military-grade riot gear.